Knowing how to make white sauce is such a handy skill to have as it forms the basis for so many yummy recipes. It is an essential ingredient in lasagna and other pasta dishes and lends itself to an endless variety of flavorings. There really is nothing to fear, you just need to follow a few simple steps. So if you’ve put off making a white sauce, then follow our step by step guide below and give it a go. Once you’ve made it several times you will soon get the hang of it. First you need to gather all of your ingredients and utensils. White sauce needs to be stirred constantly at the beginning to prevent it burning or forming lumps. You really can’t go away and leave it. Add the flour and stir quickly. Cook over a low heat, stirring constantly, for about 5 minutes. It will then come together into a smooth paste. This is enough time to just cook the flour and get rid of the “floury” taste but not enough to allow it to darken. You have now made what is called a “roux”. Remove from the heat and add about ½ cup of the milk to start and stir with a whisk. 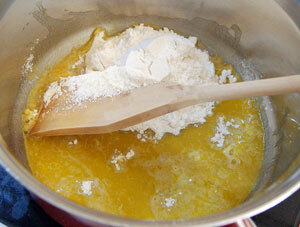 Keep whisking until the mixture becomes nice and thick and there are no lumps. This will give you a nice smooth paste and almost guarantees a lump-free white sauce . Add the remainder of the milk and return to the heat. Turn the heat up to moderately high. 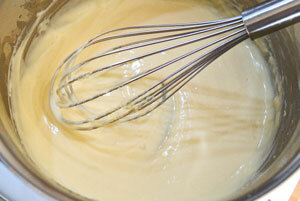 Keep stirring with a whisk until the sauce starts to bubble. When the sauce bubbles and starts to thicken reduce the heat to very low and simmer the sauce gently for 5 minutes whisking well from time to time. 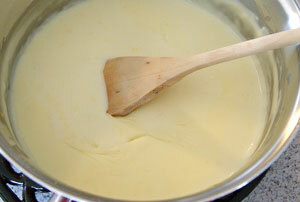 Now you have your basic white sauce which forms the basis for so many other sauces from Bechamel to Veloute. If making a cheese sauce for lasagna, add 1 cup of grated tasty cheese. Use low-fat cheese to keep it healthy. No matter what the recipe, the ratio is always 1 part fat to one part flour. Always use a whisk to stir your sauce once you have added the liquid. 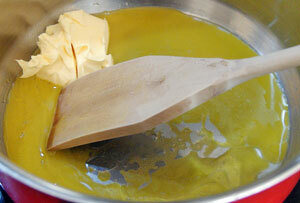 A whisk will blend the mixture more thoroughly than a spoon and help avoid lumps. If by chance you do end up with lumpy sauce, don’t despair. Push it through a fine-mesh sieve into a clean pan and then reheat it, while whisking. Substitute full cream milk with skim milk. You can use olive oil instead of the butter. In fact olive oil is easier to handle as butter can easily burn, but the sauce will have a thinner consistency so you may need to add more flour. White sauce can be stored for up to a day in the fridge before using. To prevent a skin forming, lay some plastic wrap directly over the top of the sauce. If a skin does form, give it a good whisk as you reheat the sauce and the problem will be solved.